The following conversation between Himalaya and Sri Devi, taken from the scripture, Sri Devibhagavatam, is significant because it explains briefly the meaning, significance and the practice of the Eightfold Yoga (ashtanga-yoga). You may even consider it as a summary of the Yogasutras. The Devi defines Yoga as the identification of the individual Self with the Supreme Self. The identification is not a mere mental or intellectual notion, but a true realization, at a much deeper level, in a state of self-absorption that the Self is one and only and the rest is a mere appearance of delusion. 2-10. S'rî Devî said :-- "The Yoga does not exist in the Heavens; nor does it exist on earth or in the nether regions (Pâtâla). Those who are skilled in the Yogas say that the realization of the identity between the Jivâtma and the Paramâtmâ is "Yoga." O Sinless One! The enemies to this Yoga are six; and they are lust, anger, greed, ignorance, vanity and jealousy. The Yogis attain the Yoga when they become able to destroy these six enemies by practicing the accompaniments to Yoga. Yama, Niyama, Âsana, Prânâyâma, Pratyâhâra, Dhâranâ, Dhyâna, and Samâdhi, these are the eight limbs of Yoga. Yama includes Ahimsâ (non-injuring; non- killing); truthfulness; Asteyam (non-stealing by mind or deed); Brahmacharya (continence); Dayâ (mercy to all beings); Uprightness; forgiveness, steadiness; eating frugally, restrictedly and cleanliness (external and internal). These are ten in number. 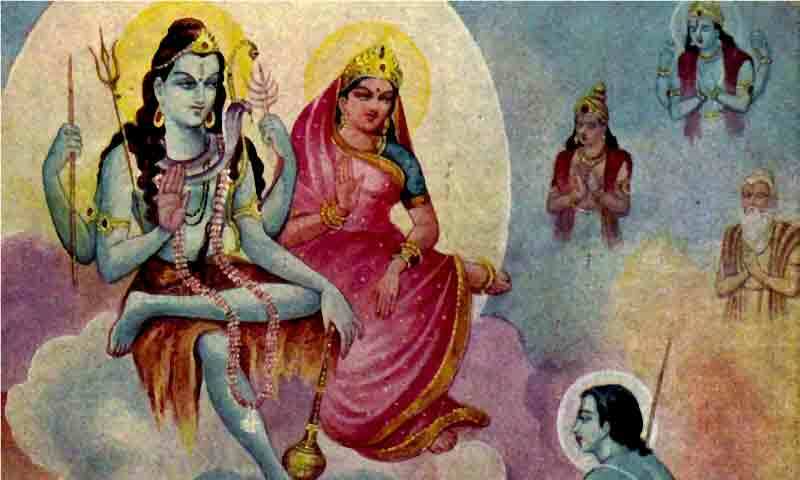 Niyama includes also ten qualities:-- (1) Tapasyâ (austerities and penances); (2) contentment; (3) Âstikya (faith in the God and the Vedas, Devas, Dharma and Adharma); (4) Charity (in good causes); worship of God; hearing the Siddhântas (established sayings) of the Vedas; Hrî or modesty (not to do any irreligious or blameable acts); S'raddhâ (faith to go do good works that are sanctioned); (9) Japam (uttering silently the mantrams, Gâyatrîs or sayings of Purânas) and (10) Homam (offering oblations daily to the Sacred Fire). There are five kinds of Asanas (Postures) that are commendable: Padmâsan, Svastikâsan, Bhadrâsan, Vajrâsan and Vîrâsan. Padmâsan consists in crossing the legs and placing the feet on the opposite thighs (the right foot on the left thigh and the left foot on the right thigh) and catching by the right hand brought round the back, the toes of the right foot and catching by the left hand brought round the back the toes of the left foot; sitting then straight and with ease. This is recommended by the Yogis (and by this one can raise oneself in the air).